"Sometimes, you need to keep things dry, cold, hot, or all three. 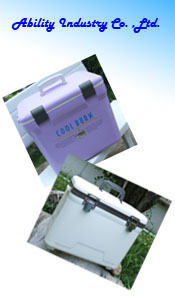 These lightweight, airtight ice boxes are perfect companions on any adventure. If some ice does melt, and they tip over in you car - no problem. There will be no mess to clean up like normal coolers boxes. The airtight gasket keeps hot air out and the cold in. The are waterproof up to a depth of 3ft. Available in 12, 18 and 28-litres capacities in either white, Blue, Dark Blue or Any color. Our Ice box/coolers are perfect for keeping food fresh, for storing sensitive electrical equipment, cameras, medical supplies or safety equipment. They float and can be used as a ditch bag.. "
copyright @ 2008 Ability Industry Company Limitedall rights reserved.